Our world is changing. It was not that long ago that I could not have made my photographs available to you in book form. The book printing industry has evolved to include “Print On Demand”, or “POD”. You can read a bit about the industry here at Wikipedia. And you can read about and see images of digital printing machines here. At this time I publish my books via Blurb. Yes, the printed book could be considered expensive. My mark-up is just $10 with the rest being earned by Blurb. I apologize in advance for the cost of the books. And at the same time I’m grateful to be able to make them available to you. If you would like to purchase 20+ books at one time please contact me directly. 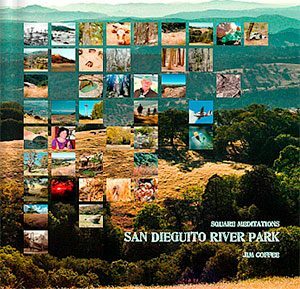 ‘square meditations San Dieguito River Park’ is an opportunity for you to become more acquainted with the San Dieguito River Park. Located near the center of San Diego County, one of the most ecologically rich and diverse counties in the country, there is much to see. Don’t rush through these more than 300 images. Relax with them. Spend time with each one. Try to ‘be there. 13″ X 11″, 154 pages. As I am out and about in the San Dieguito River Park I photograph, with a passion being panoramic photography. 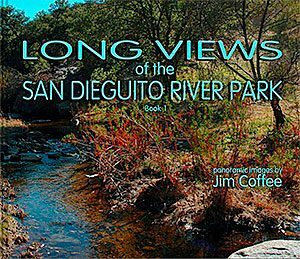 The first panorama in the book was captured at the top of the San Dieguito River Park on Volcan Mountain. The images work their way down the watershed with the last image being of the San Dieguito River as it enters the Pacific Ocean. Included are images of the ‘Great’ fire, Volcan Mountain, Santa Ysabel Open Space Preserves, Lake Sutherland, the San Pasqual Valley, Lake Hodges, the Santa Fe Valley, and the San Dieguito Lagoon, and others. The images in this book span time from January 2009 through July 2012. In future years these high resolution images will be one of the barometers that will be used to measure the changes that will occur in the San Dieguito River Park. I look forward to opening my copy of the book in 10 and 20 years…just to see how the river park has changed. The concept…thousands of years old. 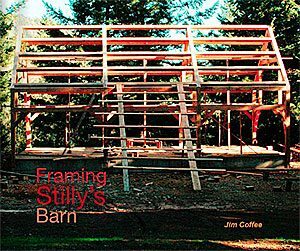 This book documents with photographs the transformation of the basic material…wood…into a ‘timber frame’ for a barn. These photographs, which span time from August through October 2004, give insight into the art of timber framing. Featuring Stilly Sprague, the owner, the dreamer, the hardest worker. And Fox Maple and a multitude of friends and volunteers from around the country. 250 images depict the cutting and framing of this timber frame barn.